The Minnesota Vikings have officially signed Sean Mannion giving Kirk Cousins and Kyle Sloter company in the quarterbacks room. Mannion and Sloter are expected to compete for the backup position. 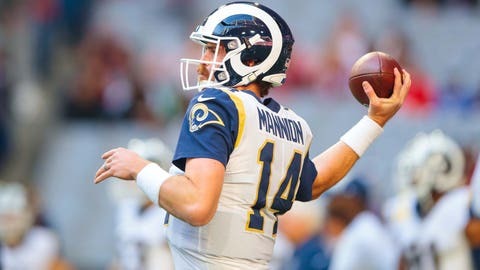 Selected in the third round by the then-St. Louis Rams in 2015, Mannion has appeared in 10 NFL games and has made one start. He’s thrown for 258 yards on 33-of-53 passing, along with one interception and zero touchdowns. Mannion’s only career start came Dec. 31, 2017 in Los Angeles’ 34-13 loss to San Francisco. Mannion registered 169 passing yards with no touchdowns or interceptions in the game. Trevor Siemian, who served as Cousins’ backup quarterback last season but didn’t play a single snap, signed a one-year deal worth $2 million with the New York Jets in the offseason. Minnesota also announced it officially signed two restricted free agents — Anthony Harris and Rashod Hill. Harris has started 17 games at safety for the Vikings and should be playing opposite Harrison Smith in 2019. Hill, who started eight games last season, will join Minnesota’s retooled offensive line in 2019. The Vikings also signed wide receiver Jordan Taylor, who caught 29 passes for 351 yards and three touchdowns from 2016-17 in Denver. He spent all of 2018 on the physically unable to perform list.